There aren't enough food, service, value or atmosphere ratings for Summit Bread Company, Canada yet. Be one of the first to write a review! 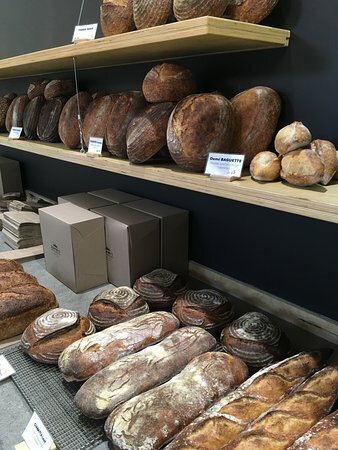 Great bread and used at several local restaurants. Excellent cookies and sticky buns. Open at 7 am for travellers and fishermen. Amazing treats, we sampled some of the wares while at the nearby brewery, then went to find the source of the yumminess. It’s close, and it’s worth finding! Wow. Wow is really all I can say. Off the beaten path, found this bakery while looking for a fish shop. It is amazing. The breads are fresh and tasty. The cookies are tasty. Everything is tasty. Plus great coffee next door. Great selection of breads, fantastic buttery croissants and according to my husband the best cinnamon buns ever! This company makes baked goods for restaurants in the area & also sells to the public. The almond croissants were among the best I've ever tasted. My daughter said the same about the chocolate croissant. Well worth stopping at this bakery. Although personally I prefer other than sour dough breads. the pastries and other items both sweet and savoury are TO DIE FOR. I was excited to visit this new spot and was not disappointed. Came out with a variety of four pastries. Everything was lovely. Very tasty. Will be back many times before we leave. Get quick answers from Summit Bread Company staff and past visitors.